Glenn Gabell Anderson, age 87 of Pepper Pike, OH. Beloved husband of the late Marcella F. Anderson (nee Fisher); loving father of Marcella Anderson Distad (James Voltz) of Richfield, OH, Glenn G. Anderson, Jr. (Eleanor) of Gates Mills, OH and Robert F. Anderson of Cuyahoga Falls, OH; dear grandfather of Jonathan M. Distad (Lenge Hong) of New York, NY, Henry C. Distad (Jordan) of Bainbridge, OH, Christopher P. Distad of Cincinnati, OH, Edith M. Anderson of Lakewood, OH and Benson H. Anderson of Gates Mills, OH; great-grandfather of Marcella J., George J. and Louis C. Distad. Graduated Cleveland Heights High School (1949), Princeton University (BS,1953) and Harvard Business School (MBA,1957). Former Executive with the Illuminating Company and Ameritrust. For more than 50 years, he was actively involved with the Boys Scouts of America, becoming an Eagle Scout (1945), and receiving both the Silver Beaver award (1968) and Silver Antelope award (2000), along with serving as a Trustee for the United Way, the Cleveland Rotary Club, and former Board Chair of the Red Oak Camps. He was also an Elder for the Church of the Covenant, and volunteered for Hiram College. 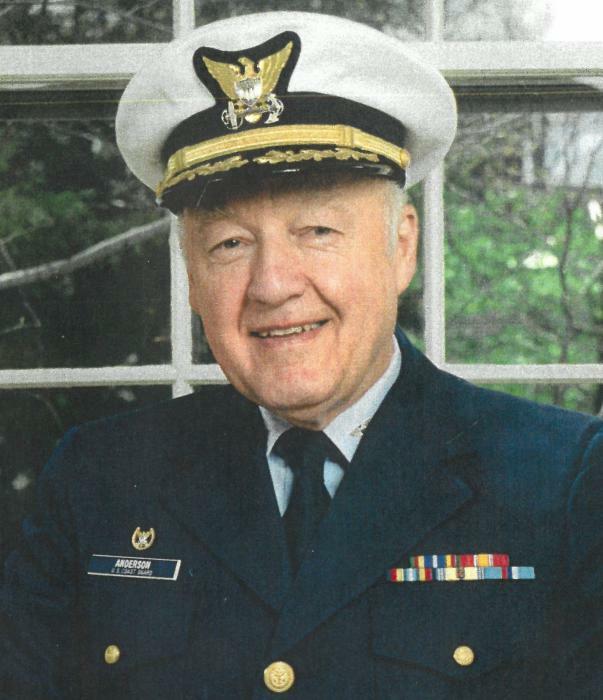 In addition, he served with the United States Coast Guard in Sitka, Alaska, and was a retired Captain from the US Coast Guard Reserves. He was a member of the Kirtland Country Club, Cleveland Skating Club, Tavern Club and Rowfant Club. The family prefers that those who wish may make contributions in his honor to the Boy Scouts of America – Great Trail Council, 4500 Hudson Dr., Stow, OH 44224 (www.gtcbsa.org), Holden Forest and Gardens, Development Office, 9500 Sperry Rd., Kirtland, OH 44094 (www.holdenarb.org), or a charity of your choice. Glenn’s family wishes to acknowledge and to send heartfelt thanks to the staff at Renaissance of Richfield for welcoming Glenn into the community family, and for providing him loving, kind, and tender care. A Memorial Service will be held at 4 pm on Friday, February 1st at the Church of the Covenant, 11205 Euclid Ave., Cleveland, OH 44106. Interment will be in Lake View Cemetery..